Paper : 4 sheets 22cm x 27cm with revenue stamp. This is a standard form for a 'Memorandum of Agreement' with 3 sides completed mainly in manuscript. The final 4 sides are printed conditions of sale. 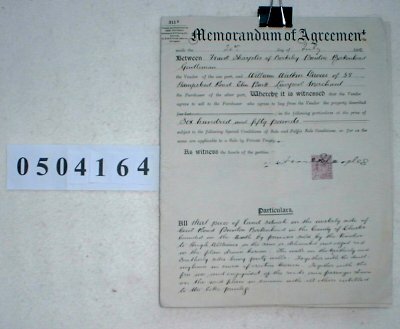 Memorandum of agreement for the sale of property in Prenton, Birkenhead.